Whether for a stopover at Orly Airport or a meeting at SILIC/ICADE business park, come and relax at the Novotel Paris Orly Rungis hotel. Get cozy in one of our business or family rooms. Our fitness center, outdoor swimming pool and terrace will make your stay a unique experience. Get to know our bartender Richard and his house cocktails at the bar. Or sit back in the Novotel Café restaurant and enjoy Chef David's gourmet menu and fresh produce that will satisfy all your cravings. 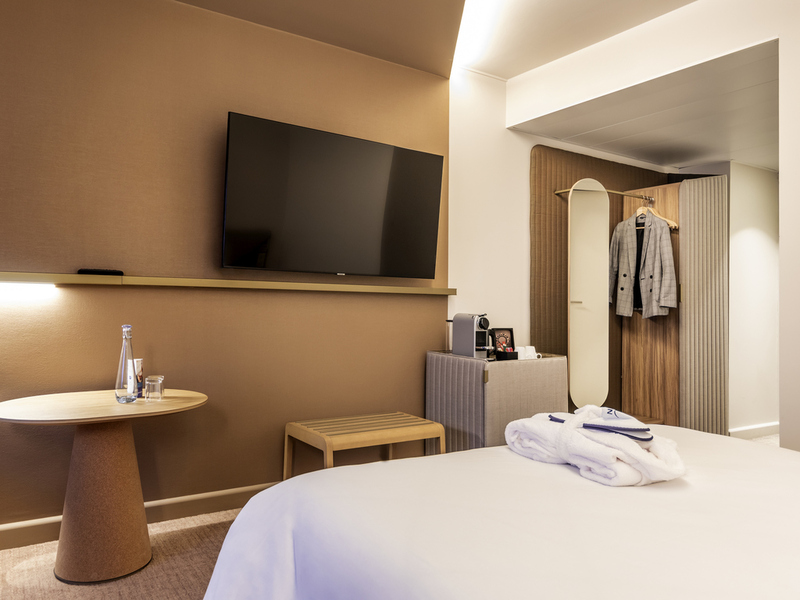 For a relaxing weekend or week in Paris, Novotel is the place for your escape. The Novotel Paris Orly Rungis hotel is located just a few minutes away from Orly airport with a free shuttle service that also runs to the SILIC/ICADE business park in Rungis. Rungis International Market, Paris, the Porte de Versailles exhibition center, Thiais and the Espace Jean Monnet complex are all within quick reach. It is also easy to reach Disneyland Paris. Spacious, contemporary in design and adaptable, the Novotel room is true living space, perfect for all your needs. For greater comfort, choose our Executive Room: bathrobes, slippers, Nespresso coffee. The overall experience was good. Check-in was quick and straight forward and the hotel looked clean. However, looking a bit closer some areas of the hotel looked a bit dated. The room was clean and had a large TV. However, the fan for the air conditioning was very loud so I had to open a window. The bathroom was not great, being made from moulded plastic and the shower did not stay in its bracket. Very nice hotel, but there are not many things to do in the surroundings. There was just a McDonalds a couple of blocks away, 5min by walk. The hotel has a good restaurant, swimming pool, but no sauna, and has a free shuttle each 30min to Orly Airport, which for me was a must, as I had to be there for my flight at 7:00am. It was nice to arrive late and have posibility to have a dinner. Personal care was nice and friendly. Another pleasant' stay at the hotel. Fast efficient check in, nice room, comfortable bed, nice food and service in the café both for evening meal and breakfast. Efficient check out. The extra cost foe getting the room after a long trip is too expensive especially if you stayed 24h. Room 112 was very noisy. I enjoyed the cleaning , the Tv, the huge bed. Missed more on rhe minibar.. The hotel is clean and the rooms are fine even a little bit pricey. However the food was great and even staff was really nice. At the counter of at the restaurant people were very helpful. Excellent staff, superb food and a very nice bar. Room was very good. Very nice staff, hyper-professional. Very good food and drinks. Perfect for an ovenright stay. Reasonable price. clean room with all amenities. Good choice of food in the dining room. Dear VICTORIA GRACE V., We very much appreciate your comments regarding your stay at the Novotel Paris Orly Rungis. It is always a pleasure to receive positive feedback. I will share your comments with our team. I am sure that this feedback will serve as an encouragement to all of our staff as we strive to continuously improve the quality of our services. Thank you again for sharing your experience, and we hope your next visit will be as pleasant as the previous one. Sincerely, Michael PERIES, Directeur Général / General Manager Novotel Paris Orly Rungis. Dear MIROSLAV K., We very much appreciate your comments regarding your stay at the Novotel Paris Orly Rungis. It is always a pleasure to receive positive feedback. I will share your comments with our team. I am sure that this feedback will serve as an encouragement to all of our staff as we strive to continuously improve the quality of our services. Thank you again for sharing your experience, and we hope your next visit will be as pleasant as the previous one. Sincerely, Michael PERIES, Directeur Général / General Manager Novotel Paris Orly Rungis. Efficient and friendly staff. Comfortable rooms and well soundproofed. The cafe menu was well balanced and the food excellent quality/price value. Dear MICHAEL M., We very much appreciate your comments regarding your stay at the Novotel Paris Orly Rungis. It is always a pleasure to receive positive feedback. I will share your comments with our team. I am sure that this feedback will serve as an encouragement to all of our staff as we strive to continuously improve the quality of our services. Thank you again for sharing your experience, and we hope your next visit will be as pleasant as the previous one. Sincerely, Michael PERIES, Directeur Général / General Manager Novotel Paris Orly Rungis. Very good stay at the hotel. Staff is absolutely nice. Place is enjoyable with nice terrace, old unexpected eucalyptus and swimming pool. Dear MIRYAM B., We very much appreciate your comments regarding your stay at the Novotel Paris Orly Rungis. It is always a pleasure to receive positive feedback. I will share your comments with our team. I am sure that this feedback will serve as an encouragement to all of our staff as we strive to continuously improve the quality of our services. Thank you again for sharing your experience, and we hope your next visit will be as pleasant as the previous one. Sincerely, Michael PERIES, Directeur Général / General Manager Novotel Paris Orly Rungis. Dear ADRIAN J., We very much appreciate your comments regarding your stay at the Novotel Paris Orly Rungis. It is always a pleasure to receive positive feedback. I will share your comments with our team. I am sure that this feedback will serve as an encouragement to all of our staff as we strive to continuously improve the quality of our services. Thank you again for sharing your experience, and we hope your next visit will be as pleasant as the previous one. Sincerely, Michael PERIES, Directeur Général / General Manager Novotel Paris Orly Rungis.